Progress billing occurs when you actually invoice, or bill, a customer for a portion of an amount that you’ve previously estimated. 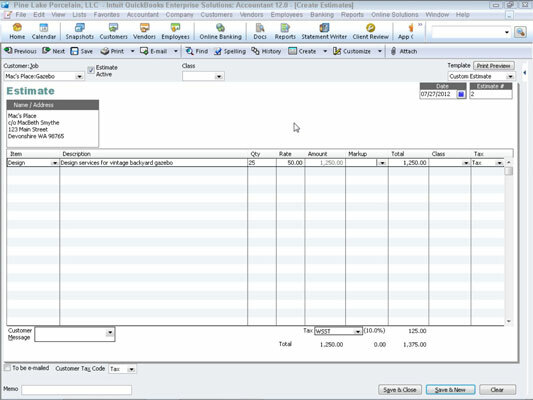 For example, take a peek at the QuickBooks 2012 Create Estimates window. Suppose that this window records an estimate that a client has asked you to supply. Further suppose, just for purposes of this discussion, that the estimate is for a consulting job that you’re doing. If you want to later bill the consulting client for the actual work, you click the Create Invoice button that appears along the top edge of the Create Estimates window. QuickBooks displays the Create Progress Invoice Based On Estimate dialog box. 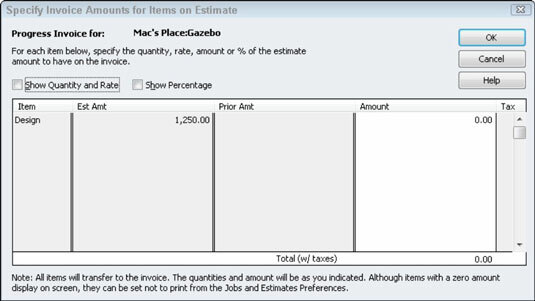 This dialog box lets you create an invoice by using the estimate information. If you select Create Invoice for the Entire Estimate (100%), QuickBooks creates one invoice that uses all the information from the Create Estimates window. Alternatively, you can select one of the other option buttons to bill only a portion of the estimate. For example, you can select the Create Invoice for a Percentage of the Entire Estimate radio button and then enter the percentage into the % of Estimate box. In this case, QuickBooks bills the customer for some specified percentage of the estimate. Alternatively, you can also select the Create Invoice for Selected Items or for Different Percentages of Each Item radio button. In this case, QuickBooks lets you specify that different percentages of the items shown on the estimate should be billed. When you click OK, QuickBooks either creates the invoice by using the estimate information or, if you indicated that you wanted to specify different percentages for different items on the invoice, QuickBooks displays the Specify Invoice Amounts for Items on Estimate dialog box. You use the Amount column to specify a portion of the estimated amount that you want to bill on the progress invoice. If you select the Show Quantity and Rate check box on the Specify Invoice Amounts for Items on Estimate dialog box, QuickBooks adds columns to the dialog box that let you see quantity and rate information. Similarly, if you select the Show Percentage check box, QuickBooks adds columns to the dialog box that show percentages. You probably don’t need this extra information, but if it’s important to be very precise on your invoice, you may want to experiment with these additional columns of information.